Megan brings to the CeRDI team a broad range of experience gained across 15 years in the science, environment and education sectors. 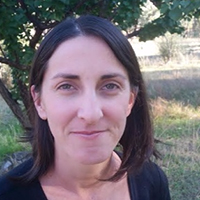 Megan completed her PhD in 2014 at Monash University which investigated the association of soil biology with vegetation and land use change across the Riverine Plains of Victoria. Her work has taken her from a medical research laboratory to a wide range of agricultural and natural landscapes in Australia where she has monitored, established trials, collated and analysed data for government organisations, community groups and universities. Megan has also worked across education sectors, including teaching environmental subjects at the tertiary level and conducting reviews and evaluations in the adult education sector. 2013 - 2016. Independent Research Assistant and consultancy. Program evaluation, field surveys and soil ecology. 2009 - 2013. Monash University. PhD Candidate, Teaching Associate. 2006 - 2009. Department of Education and Early Childhood Development. Classroom Teacher. 2003 - 2004. Research Assistant. Department of Conservation and Land Management and The Howard Florey Institute. Schefe, C.R., Grant, C.D., Dahlhaus, P., Robinson, N., Wong, M., Walker, R., Janik, L., Jones, D., & Fleay, B. (2018). Capturing in-paddock variability and the quest for spatial PAW prediction: a team sport. SOIL: The key to the past, the present and the future. National Soils Conference, November 18th - 23rd, Canberra, Australia. Soil Science Australia. Wong, MR, Morgan JM, Cavagnaro TC (2011) Microbial community functional groups: Links to vegetation and ecosystem properties of semi-arid grasslands in south-eastern Australia. In Bornette, G. & Puijalon, S. (eds), 54th Symposium of the International Association for Vegetation Science: Abstracts. Université Lyon 1 Service Formation Continue et Alternance. Wong, S., Wong, I., Walker, L., & Wong, M. (2014). Decent training for decent work: Strengthening employment outcomes (Strategies to improve connections between Learn Local offerings and employment outcomes for learners). Grampians ACFE Region Research Report 2014. Ballarat, Australia: Pascal International Observatory. Wong, S., Wong, I., Walker, J., Wheeler, L., & Wong, M. (2014). Learning locally: Better understanding the complexity and costs of service delivery in rural locations. Barwon South-West Adult, Community and Further Education Region Research Report 2014. Geelong, Australia: Pascal International Observatory. Wong, S., Wong, I., Bergin, C., Wong, M., & Lomnicki, I. (2014). Youth Now BiZE Centre Evaluation. Sunshine, Australia: Youth Now. Wong, S., & Wong, M. (2014). YouthNow BizE Centre Evaluation - Scan of the Literature. Sunshine, Australia: Youth Now. Wong, S., & Wong, M. (2014). Work's 4 Me Evaluation: Transitioning to training and employment program for people with disabilities in the City of Melton, Victoria. Sunshine, Australia: Youth Now. Wong, S., & Wong, M. (2014). Work's 4 Me Evaluation: Scan of the Literature. Sunshine, Australia: Youth Now. Wheeler, L., Wong, S., Wong, I., et al. (2013). Evaluation of the Transition Brokers Program. Hume Whittlesea Local Learning and Employment Network. Melbourne, Australia: Whittlesea Youth Commitment.